Elena Hengel and Zipp. Photo by Sportfot. 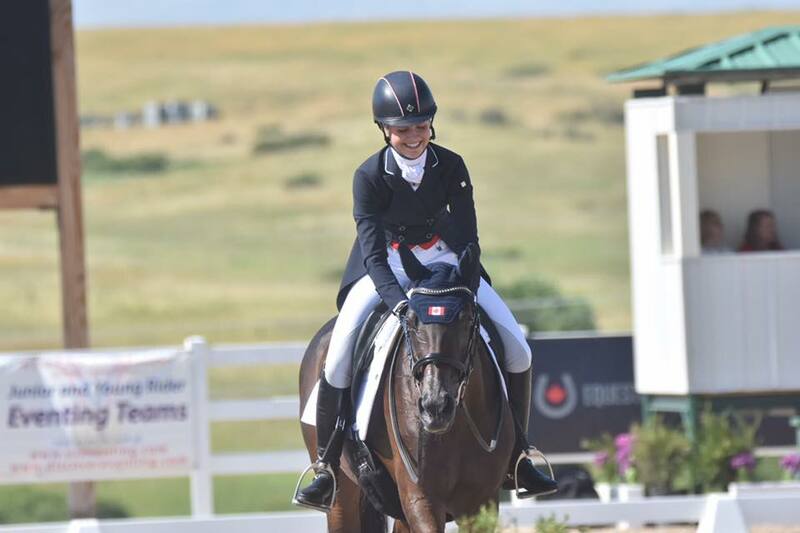 The fifteen CICY2* competitors took to the sandbox today in the North American Junior & Young Rider Championships at the Colorado Horse Park, with Elena Hengel dominating the individual leaderboard with both of her horses. 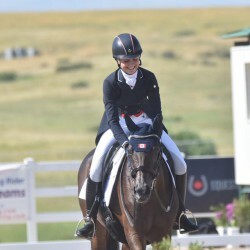 Zipp, Elena’s own 12-year-old Dutch gelding that carried her to an eighth-place individual finish in the 2014 CH-J* at Young Riders, scored 42.7 to easily lead after the first phase. 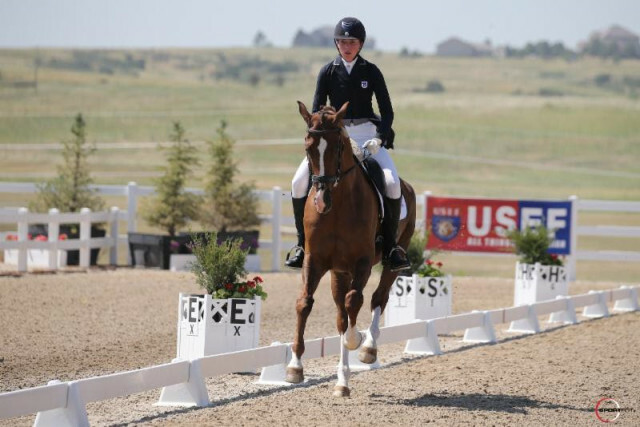 Say I Do or “Donovan,” a 12-year-old Irish Sport Horse gelding Elena owns, scored 46.0 to sit in second place. Elena is riding Say I Do in the team competition for the hybrid Area III/IV team, which is currently sitting in second place on a total score of 156.0. Canada’s Alberta/Ontario team is leading the way in the team standings by a narrow margin on 153.2, with Shelby Brost and Crimson in fifth on 50.2 as the highest-placed combination for the Cannucks. Shelby Brost and Crimson. Photo by JJ Sillman. “Crim felt great today. She gave it her all. We’ve been training really hard these last few weeks, putting some finishing touches on and she brought all of that to the ring. I really don’t think I could have gotten more from her in that test. She was foot perfect,” Shelby said. 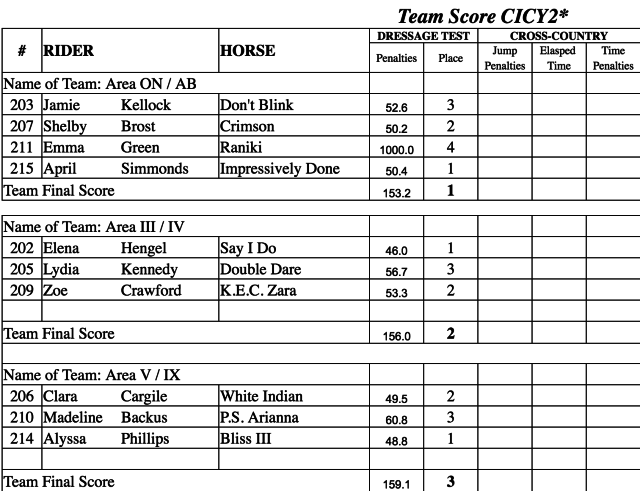 Looking to the rest of the individual leaderboard, Alyssa Phillips and Bliss III delivered a personal best score of 48.8 to sit in third place. 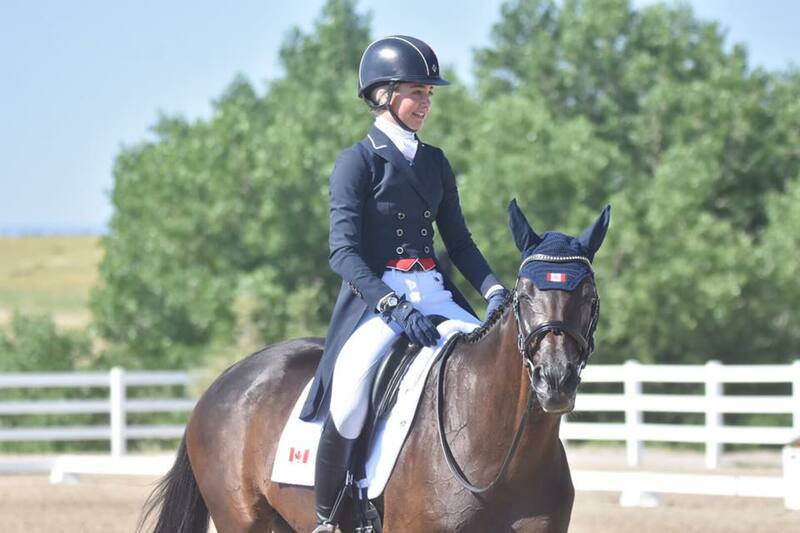 Alyssa and the 10-year-old Dutch mare owned by Julie Phillips competed on the silver-medal winning CH-J* team in 2014, and their Area V/IX hybrid team is currently sitting third in the CICY2* on 159.1. 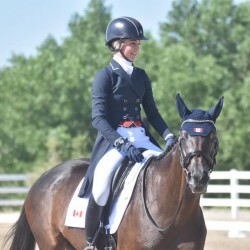 Fellow teammate Clara Cargile and White Indian, a 16-year-old Irish Sport Horse gelding owned by Nancy and John Cargile, also delivered a personal best of 49.5 to sit in fourth place. 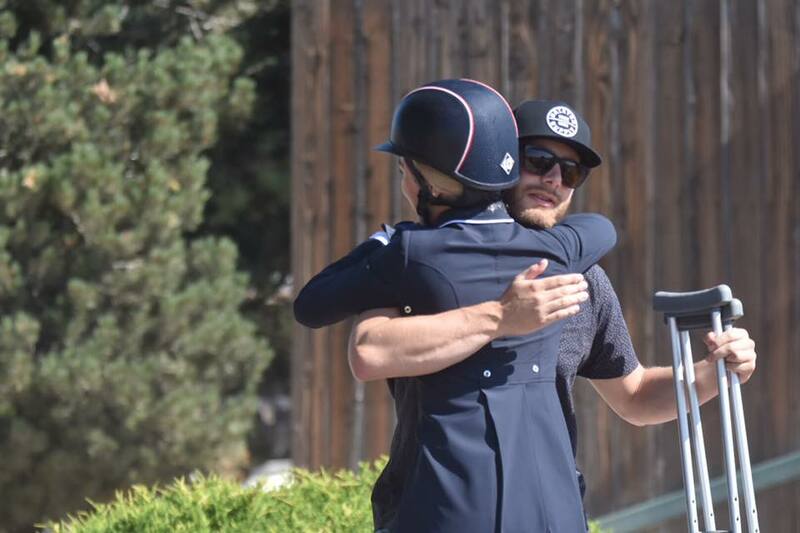 This pair won individual bronze in the CH-J* at Young Riders in 2015, so we have a highly decorated leaderboard so far in this CICY2* competition. 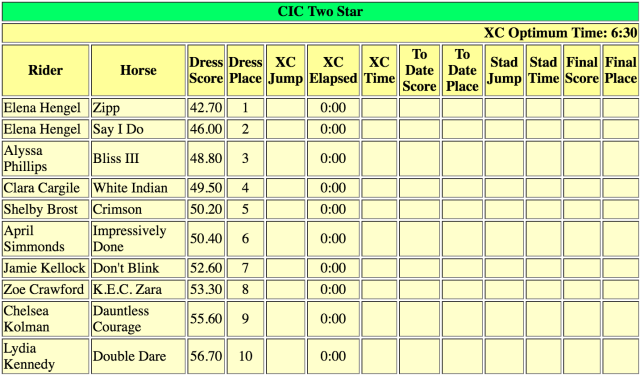 The two-star riders now look ahead to tackling James Atkinson’s cross country course on Saturday. Less than 10 penalties separate the top seven, and less than six penalties separate the top three teams, so it will be a race against the clock on cross country day. The CH-J* riders take on the sandbox tomorrow. Ride times will be popping up at this link at some point today, so keep checking back. 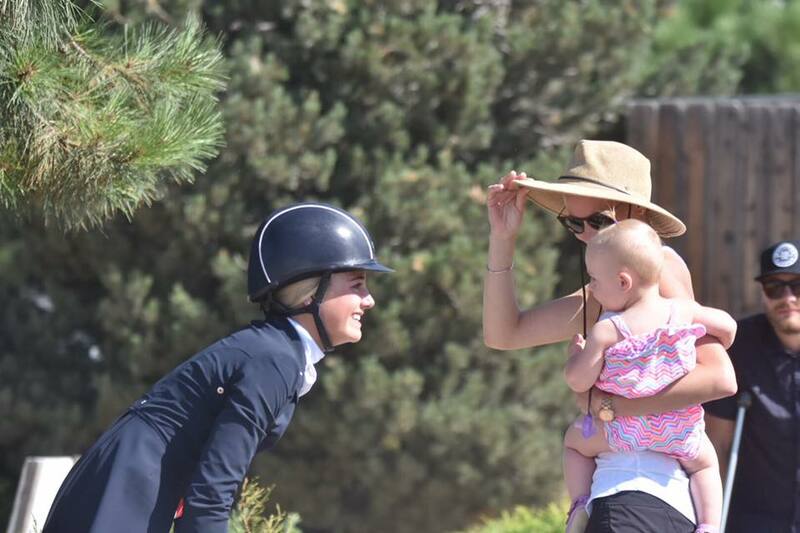 Go Young Riders!